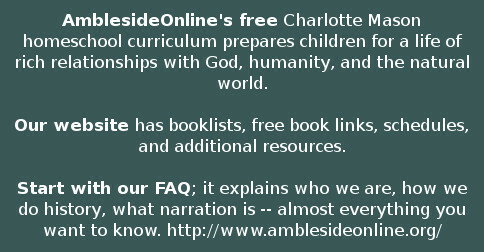 AmblesideOnline is a free homeschool curriculum that uses Charlotte Mason's classically-based principles to prepare children for a life of rich relationships with everything around them: God, humanity, and the natural world. AO's detailed schedules, time-tested methods, and extensive teacher resources allow parents to focus effectively on the unique needs of each child. The AmblesideOnline library hosts a large collection of original Charlotte Mason materials, which have been digitized by our volunteers. 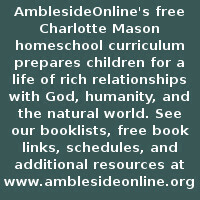 In addition, our community offers a wide variety of resources for homeschooling parents and Charlotte Mason educators: a support forum, an archive of wisdom from experienced Charlotte Mason educators, as well as original and current books and articles about Charlotte Mason's living ideas. Use of AmblesideOnline materials implies that you have read and agreed to our License Agreement.